Kyivan Patriarchate in The United States and Canada. The Vicariate of The Ukrainian Orthodox Church Kyivan Patriarchate is an integral part of the Ukrainian Orthodox Church Kyivan Patriarchate under the protection (omophor) of His Holiness Patriarch of Kyiv and All Rus-Ukraine Filaret. It represents those parishes and believers who have stayed within the National Mother Church (Pomisna Cerkva) of Ukraine. The Ukrainian Orthodox Church Kyivan Patriarchate is a direct descendant of the Ukrainian Autocephalous Orthodox Church of 1921 under Metroplitan Vasyl Lypkiwskyj. The Ukrainian Orthodox faithful in the United States and Canada were all part of this church and were sent hierarchs from Ukraine to serve the faithful. The first of which was His Beatitude Metropolitan John Theodorovich. The UAOC was persecuted in Ukraine and thousands of Bishops and priests were executed at the hands of the Bolshevik regime. In an unfortunate event, illegal by the statutes of the Ukrainian Orthodox Church in The USA, after the death of Ukraine's first Patriarch, His Holiness Patriarch Mstyslav, the hierarchy of The Ukrainian Orthodox Church in the USA renounced their autocephaly and left The Ukrainian Orthodox Church in 1994. These hierarchs joined The Ecumenical Patriarchate as Titular Bishops of the throne and left The Ukrainian Orthodox Church with its historical center in Kyiv, Ukraine. It was at this time that many Ukrainian Orthodox faithful decided to stay with the mother church and honor their ancestors wishes and the wishes of our martyred clergy who were executed for their faith. 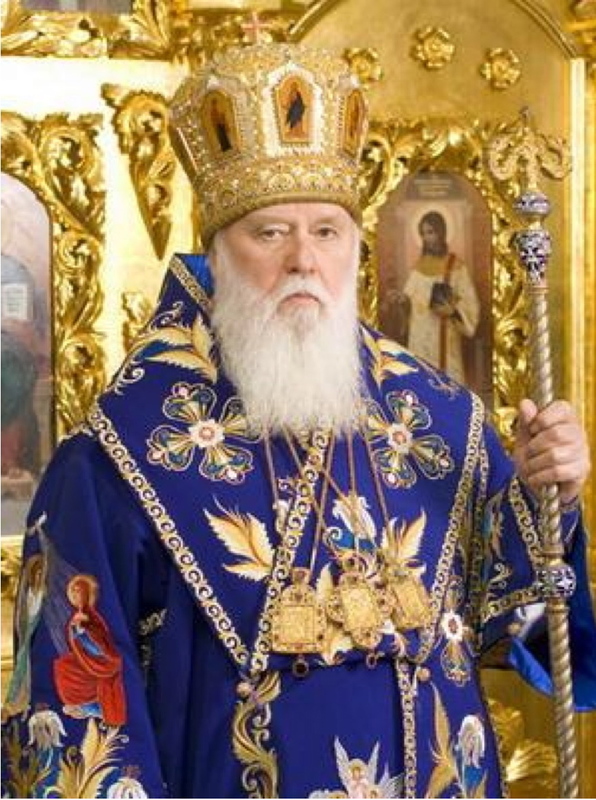 The Vicariate of The Ukrainian Orthodox Church Kyivan Patriarchate in The USA and Canada, calls on all of its children in North America to honor the wishes of Patriarchs Mstyslav and Volodymyr and not succumb to foreign rule but rather unite with The Ukrainian Orthodox Church Kyivan Patriarchate. The Ukrainian Orthodox Church, Kyivan Patriarchate is The Pomisna (National/IAutocephalous) Orthodox Church of Ukraine. It serves the spiritual needs of all Orthodox christians throughout the world. At this time The Ukrainian Orthodox Church - Kyivan Patriarchate has approximately 40 hierarchs, over 4000 parishes in Ukraine alone and 29 Eparchies in the various regions of Ukraine. It also has parishes throughout Europe (Germany, Greece, Moldova etc.) and The Vicariate of The USA and Canada. The Patriarchate has functioning educational centers such as The Kyiv and Lviv Theological Academies, seminaries in Lutsk and Rivne, a Theological Institute in Ivano-Frankivsk, and an accredited Philosophical and Theological curriculum at The National University of Chernivtsi. The Patriarchate has the support of over 10 million faithful in Ukraine. (In comparison The Moscow Patriarchate in Ukraine has the support of approximately 5 million faithful in Ukraine) In December of 2006 in the Capital Of Ukraine Kyiv, a public news poll found 52% of those asked were supporters of The Ukrainian Orthodox Church - Kyivan Patriarchate and only 8% aligned themselves with The Moscow Patriarchate. On June 8, 2010 in Istanbul a meeting was held between President of Ukraine Victor Yanukovych and Ecumenical Patriarch Bartholomew. This meeting testifies to respect that the head of the state extends towards the Mother-Church of Constantinople and the attention paid by the Ecumenical Patriarch to Ukraine. During his tenure of presidential office Victor Fedorovych Yanukovych met several times with Metropolitan Volodymyr, Primate of the UOC-MP, two times with Patriarch Kirill of Moscow and now he met with Ecumenical Patriarch Bartholomew. Judging by the president’s words that “one cannot build strong country without faith”, one should expect him to meet with heads of other Ukrainian Christian confessions and religious organizations. The Kyiv Patriarchate is grateful to Ecumenical Patriarch Bartholomew for his prayers for Ukraine and the unity of the Ukrainian Church. We hope that the Mother Church of Constantinople will continue acting not just prayerfully, but by other means, in accordance with the assumed burden of primacy in Orthodoxy, on the lines of overcoming church division in Ukraine, provoked by non-canonical actions of the Moscow Patriarchate, keeping in mind the words of Christ “and whoever wishes to be first among you shall be slave of all” (Mark 10:44). On our part we have to state that the Kyiv Patriarchate did not secede from the Orthodox Church for we unfailingly confess Orthodox faith and perform canonical prescriptions in our church life, We separated from the Moscow Patriarchate and do not recognize its authority over Ukrainian Church – but the Patriarchate of Constantinople itself stated in the Tomos of Autocephaly of the Orthodox Church in Poland (1924) that joining of the Kyiv Metropolis to the Moscow Patriarchate in 1686 was carried out regardless of prescriptions of the canon law and therefore is illegal. Therefore we do not fully understand an idea expressed by His Holiness Patriarch Bartholomew when he said: “all our brothers who seceded should come back to the canonical Church”. What is the Ecumenical Patriarch speaking about? Does His All Holiness mean returning of the Kyiv Metropolis, which was illegally separated by Moscow, to the previous canonical order and subordination to the Throne of Constantinople? In such an instance these words should be addressed to Moscow Patriarchate that illegally retains power over the Church in Ukraine. It is obvious that His Holiness the Patriarch had an opportunity to get this viewpoint across to Patriarch Kirill of Moscow in the course of his recent visit to Russia. Could His Holiness possibly refer to subordination of the Kyiv Patriarchate to the Moscow Patriarchate? If that is the case, this idea does not conform to the stance of Constantinople as for non-canonicity of the power of Moscow over the Ukrainian Church that we know for sure from the Tomos mentioned. Did His Holiness Patriarch Bartholomew possibly have in mind subordination of our hierarchy, clergy and faithful to his Throne? But neither the bishops nor the priests and laity of the Kyiv Patriarchate have ever separated from the Patriarchate of Constantinople, for they have never been under its authority. And those who have not separated cannot return to unity. If we consider this issue in the historical context, for a longtime the Kyiv Metropolis had resisted attempts of the Moscow hierarchs to subordinate it for all it is worth, and had unfailingly preserved unity with the Throne of Constantinople – till the time when, to our mutual regret, the patriarch of that time, subduing to pressure and for rich gifts, illegally issued the charter on the strength of which Moscow gained power over our Metropolis. Thus, from the words of His Holiness the Patriarch that we know it is yet unclear what particular ways of overcoming division of the Church in Ukraine he sees except fervent prayers that we share and lift up to the Throne of God. The only comprehensible interpretation of His Holiness Bartholomew’s words for us is that he referred to returning of all the Orthodox in Ukraine to the prayerful and Eucharistic communion, which is a manifestation of the Church unity. It is against our will that we have no such unity, but we are always ready to do all possible to restore it. Though it is our firm conviction that overcoming church division and subordination of one Church to another are different things and one cannot be replaced by another. In the history of both the Patriarchates of Constantinople and Moscow there were precedents of breaking the Eucharistic unity – between it and other Churches, and even inside it. However we see that these breaks – between Constantinople and the Churches of Greece and Bulgaria, between Moscow and the Church of Georgia and American Metropolis – were coped with not by means of subordination, but through reconciliation and recognition of autocephaly. Misunderstandings that emerged in Estonia and Great Britain also do not prevent Eucharistic communion of the two Patriarchates. Therefore on our part we insistently and unalterably strive for restoration of Eucharistic communion with all the Local Churches – and hope that His All Holiness the Ecumenical Patriarch will further this good deed in a fatherly manner. As for participation of the Ukrainian state and its head in overcoming of the existing inter-church controversies, the stance of the Kyiv Patriarchate was stated straight and clearly in the letter of the Holy Synod addressed to Victor Yanukovych, dated May 14, 2010. In completion we have to note that enjoying the freedom of preaching and faith confession, running freely our churches, monasteries and education establishments, it is with pain and sorrow that we observe the limitations imposed on the Patriarchate of Constantinople by the state laws of its country of residence. Having possibility to gather for prayers in thousands of churches and to hold sacred processions freely, we regret that our Mother-Church is in such restrained conditions, and in spite of all efforts, cannot change them for the better. We pray for her and ask God to grant her the freedom of faith, worship, education and preaching that we enjoy in our country. This case has much in common with the lawsuits filed by the former bishops of The Ukrainian Orthodox Church in Bound Brook against Holy Acsension in Clifton, NJ. We are pleased to see that the former ROCOR parish has stuck to their principles and has won this case. It is a shame that the hierarchs in both cases would not honor the will of the people who built and support the parishes. Oxnard, Calif. – March 26, 2010 – Holy Trinity Eastern Orthodox Church, founded in Oxnard more than 40 years ago by refugees who escaped from the former Soviet Union, has prevailed in a lawsuit brought against it by the Russian Orthodox Church Outside Russia (ROCOR). The Ventura County Superior Court has entered judgment in favor of Holy Trinity, ending ROCOR's attempt to confiscate the church's property. Holy Trinity was founded by Russian immigrants, many of whom lost family members and loved ones in the wake of the Soviet government's persecution of Orthodox Christians. These refugees came to Ventura County to work in agriculture after World War II, and became patriotic American citizens. In 1965, construction began on Holy Trinity's beautiful church building, located on Alvarado Street in Oxnard. Funded entirely by member donations, the church, bearing the typical Byzantine domes and elaborate icons, was completed in 1966. A plaque on the outside of the church expresses the founders' gratitude to America, and the church's articles of incorporation pledge always to uphold the U.S. Constitution. In March 2007, after much prayer and deliberation, the members of Holy Trinity voted unanimously to separate from ROCOR after it announced plans to reunite with the Moscow-based Russian hierarchy. Holy Trinity disagreed with that course because most of its members still remember the Moscow church's collaboration with the Soviet authorities during the Cold War. In April 2007, ROCOR sued Holy Trinity and several of its volunteer leaders, demanding that the church forfeit all of its property – the same property that the individual members of Holy Trinity sacrificed to build. After two years of litigation, the Superior Court dismissed ROCOR's complaint and entered judgment for Holy Trinity. This now ends the litigation and allows Holy Trinity to focus on preserving and sharing the Orthodox Faith with the Oxnard community. Holy Trinity holds worship services every Sunday at 2784 Alvarado Street in Oxnard.